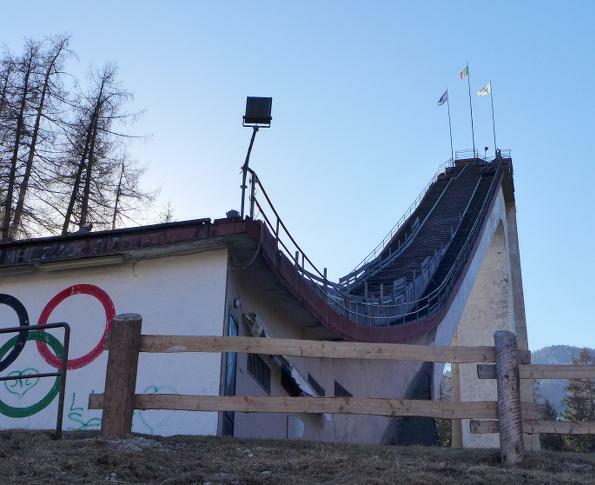 The project aims to regenerate the architectural and environmental complex that hosted the ski jumping competitions during the 1956 Winter Olympics, a complex nowadays abandoned and in an advanced state of disrepair. The Theme Park is a unique innovative facility, economically self-sufficient and responsive to new trends in the field of sport coupled with leisure and cultural activities. It includes sports activities (shooting range for biathlon, paths and lanes for "dry" athletic activities, gym, nordic walking and mountain bike trails), training and assessment activities (training area, assessment centre, physiotherapy area, research and development spaces), cultural activities (Italian Museum of Winter Sports, Olympics Museum, Podium Area, Collections), recreational activities (equipment test facilities, Flight of the Angel, viewpoint over the Trampolino Italia ski jump, adventure park) and complementary activities (car parks, shopping, tourism, accommodation, bars and restaurants). The Master Plan’s operations cover four distinct areas: conservationist restoration (Trampolino Italia), renovation (the lower-quality terraces), new building (in the higher-quality terraces area), landscaping (whole complex) and the creation of a road link to State Highway no. 51. The Filiera Veneta companies involved in the project are, in addition to CandC architettura ingegneria sas, GSE srl, Ranzato Impianti srl, Il Prato, Enne Service srl and Copertekno. Luisa Flora has outlined the museum project. The collaborators were: The Italian Winter Sports Federation (FISI) and the Ski Club Cortina for the "sports project", the Holmenkollen Skimuseet in Oslo and the Norges Olympiske Museum in Lillehammer together with the Federal Technical School of FISI for the "cultural and museum exhibition project", Larry Smith Italia s.r.l. ​​for the economic feasibility study and the strategic concept, Rimond s.r.l. for time scheduling. The following acted as consultants: Alvise Martini (San Marco spa) and Michele Moretto (Devizia Transfer spa).